But he did not say it for bragging rights — he was demonstrating that the suitability standard is effective. The key is approaching every annuity sale with the right intentions, said Carter, 71, who owns Financial Security Associates, a regional independent marketing organization based in Raleigh, N.C.
Carter describes Financial Security as a regional IMO, or “a very small fish in a very large pond.” For many years, business was good and steady — 100 to 150 regular agents writing the bulk of $350 million in annual annuity sales. Then the regulators got busy. 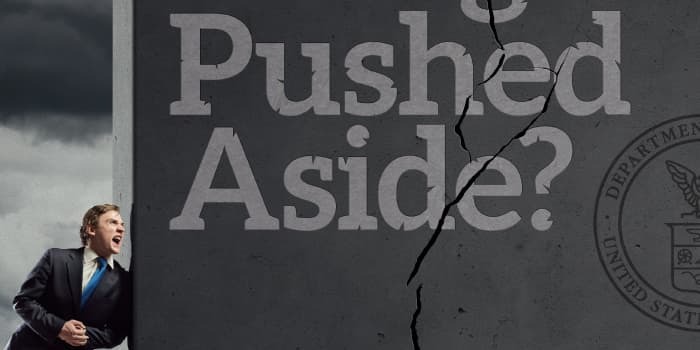 By the time a three-year fight to knock down the Department of Labor fiduciary rule was finished, Carter had lost nearly 30 percent of his annual business. Worse than that, the federal regulators unleashed Game of Thrones-level warfare in the IMO world. And the smaller shops like his own were the least prepared for combat, Carter said. The DOL rule was tossed out by a federal appeals court last summer. But it was a brief reprieve. State lawmakers from New York to Arizona are considering, or have passed, annuity sales rules. The National Association of Insurance Commissioners is debating a national model. The blizzard of best-interest activity leads to a natural question: Is suitability destined to die? 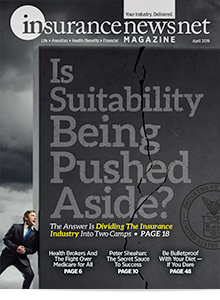 The answer is dividing the insurance industry into two camps — those who want to preserve the current suitability standard and those who accept one that is closer to the fiduciary standard. Carter remains a steadfast member of camp No. 1. “Nothing angers me more than somebody saying ‘We might as well accept it,’” he said. Suitability was destined to be short-lived, said Bruce Ashton, who has more than 35 years’ experience monitoring regulatory matters, currently as a partner for the law firm Drinker Biddle & Reath. As simple annuities morphed into indexed annuities and life insurance took a similar route, regulators concluded that consumers are vulnerable, he said. Defenders of suitability point to very low complaint numbers. The NAIC investigated 6,040 life insurance and annuity complaints in 2018, or 5.88 percent of the total complaints across all coverage lines. But while perception might not be reality, the “groundswell” for tighter regulations of insurance is probably not going away, Ashton said. Regulators across the board are now involved, which makes it harder for industry opponents to mount a coordinated fight. The DOL rule was tossed out in March 2018 after trade associations joined forces and planned to get its appeal sent to the Fifth Circuit Court of Appeals. The Fifth Circuit is known to favor limited government. The DOL rule took partial effect in June 2017, requiring advisors and agents to act as fiduciaries, make no misleading statements and accept only “reasonable” compensation. When the rule was killed by the courts a year later, it left a vacuum. 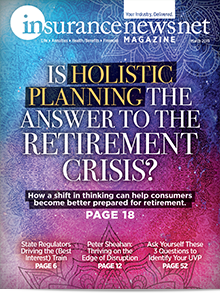 Several states launched independent rulemaking efforts, while an NAIC working group tackled an annuity sales model law. The Securities and Exchange Commission produced a tentative rule covering brokers. The onslaught of rulemaking seemed to fracture the industry alliance. 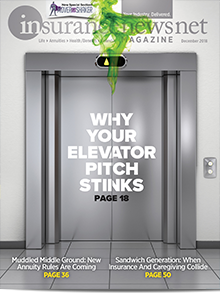 On Jan. 14, frustrated IMO executives sent a fiery letter to leading industry trade associations expressing frustration at their lack of pushback. They did not speak for the entire industry — or even the IMO set. A separate group of 10 IMOs representing “approximately 40 percent of fixed indexed annuity sales in the independent market” sent their own letter to NAIC. “We support a framework that can realize a best interest standard through a clearly and explicitly defined process that would include appropriate disclosure, thorough needs analysis and a well-supported recommendation,” their letter reads. AmeriLife is a giant in the IMO industry — one that works with 140,000 independent agents and advisors across all channels. The company spent between $2 million and $2.5 million adapting its sales processes for the DOL rule, said CEO Scott Perry. Those expenses included developing a proprietary “Amerilyzer” software tool to document client contacts and keep electronic records. 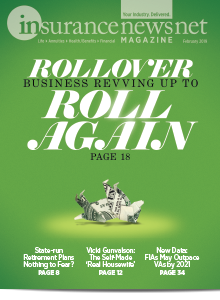 Once the DOL rule was tossed, AmeriLife dropped everything and went back to its old way of doing business, Perry said. But uncertainty costs money, and it is something the company wants to avoid, he added, even if that means making concessions on regulations. So AmeriLife is supporting the NAIC working group. It would be a major problem for the company, Perry stressed, if states splintered off into a variety of regulatory concepts. 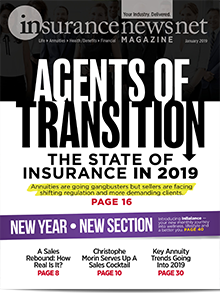 “We certainly aren’t in favor of a patchwork approach and to the degree that we feel we can get a uniform approach, the best place we think we can get that, especially for the insurance products and the insurance industry, is at the NAIC,” he said. Everyone in the industry is keeping a close eye on the New York Department of Financial Services. For starters, New York regulators are far ahead of the game, with annuity sales rules set to take effect in August. Life insurance sales must comply by February 2020. Secondly, the New York rules are very tough and would essentially do away with the suitability concept. The rules require producers always to place the customer’s interests ahead of their own. Insurers are responsible for establishing a training regimen for their producers, who will be expected to keep substantial documentation. Former DFS Superintendent Maria Vullo challenged NAIC officials to adopt New York regs in their model annuity sales rule. If that happens, it would not be the first time that New York regulators pulled the NAIC in its direction. New York previously adopted tougher cybersecurity standards than the NAIC was considering at the time. The NAIC’s final cybersecurity model ended up resembling the New York rules. Although some insurers vow not to sell products in New York, Perry said AmeriLife will adapt. New York regulators are not without industry support. Valmark Financial Group is an umbrella company with an independent broker-dealer, as well as insurance and registered investment advisor divisions. CEO Larry J. Rybka favors making New York standards the law of the land. The New York regulations treat producers and distributors more fairly, Rybka said. Still, significant opposition to the New York rules remains. A pair of lawsuits has been filed to stop the New York rule — one by The Big I and the Professional Insurance Agents of New York, and one by the National Association of Insurance and Financial Advisors-New York State. The Big I has several concerns, said Scott Hobson, director of government relations for The Big I New York, in a December interview. Specifically, they are concerned that state regulators will be able to “unilaterally” extend the best interest rule to all insurance transactions. The next battleground might be New Jersey, which published a “pre-proposal notice” in October and is seeking comments. 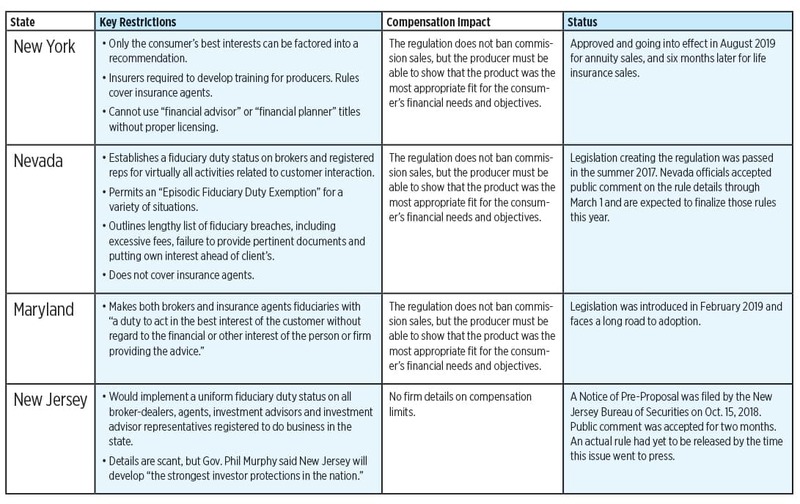 The New Jersey plan is short on details but would impose a fiduciary duty on all investment professionals in the state. Dwight Carter refuses to let the assaults on suitability go unanswered. He is a central player in the Fixed Annuity Consumer Choice campaign, a group of agents and IMOs lobbying to preserve fixed annuity sales. Many IMOs would be eliminated as well, analysts say, as a repeat of the DOL rule frenzy plays out. The premise is simple: big companies can better absorb costly regulation compliance and accompanying liability. Carter still doesn’t like it. Meanwhile, AmeriLife is “absolutely” looking to grow, Perry said. AmeriLife completed three acquisitions in the latter half of 2018, and added Dallas Financial Wholesalers in February. That addition pushed AmeriLife to $3 billion in annual annuity premium. While regulation pressure is the main driver of merger and acquisition activity among IMOs, it is not the only one. “IMOs can no longer offer just a commission and a product,” said Scott Hawkins, director of insurance research at Conning. 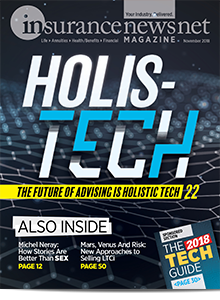 “They need to offer extra services for digital support around marketing, or around sales coaching or around electronic application and delivery around services, in order to attract producing agents. The regulation picture could potentially come further into focus in September. Reportedly, that is when the DOL and the SEC plan to release their respective rules that cover most all annuity sales. Staff from both offices are said to be working together on rules that harmonize standards. There is a potential to offer a blueprint of sorts for the industry, Ashton said. The state insurance departments are another story. With many states having wildly divergent political philosophies, as well as differing levels of insurance industry presence, any harmonizing across state lines is unlikely, Ashton said.